When the rains came, they found the girl's face. Just her face. At least that was how it appeared. And then came her hand -- small and white and fine like porcelain. It surfaced from the black mud and showed itself. Just her face and her hand, the rest of her still submerged. To look down the riverbank and see just her hand and her face was surreal and disturbing. And John Gaines -- who had lately, and by providence or default, come to the position of sheriff of Whytesburg, Breed County, Mississippi, and before that had come alive from the nine circles of hell that was the war in Vietnam, who was himself born in Lafayette, a Louisianan from the start -- crouched on his haunches and surveyed the scene with a quiet mind and a steady eye. This is what we demand of our best crime-solving people: a quiet mind and a steady eye, and an inner recognition of the horrors and pain embedded in violence. If only it could all be balanced neatly! But as Gaines will soon discover, to probe the roots of this death will also mean reactivating his own most terrible memories of the war, and facing what it has done to him. 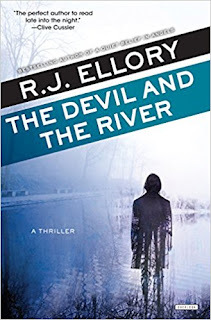 The body surfacing from the muddy river bank turns out to be that of Nancy Denton. When she was just 16, two decades earlier, she'd gone for a walk in the Whytesburg woods -- and never returned. 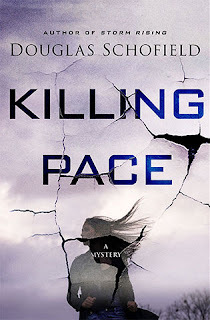 Very quickly, John Gaines realizes hers is not a recent death, but perhaps one that dates to the day of her disappearance. How has the body been preserved? What actions were taken before it found a resting place? And who felt the need to kill this lovely young woman? Gaines is an inexperienced sheriff, driven by poignant and forceful memories of killing and survival in the Vietnam jungles, as well as by a longing to have his returned-to-America life carry some goodness, some meaning, and deep justice. He soon finds that Nancy's teen years took place in a small group of close friends, where romances were both budding and frustrated. And a powerful Southern family, the Wades, is somehow involved in covering up what happened 20 years earlier. "You are perhaps made of stronger stuff than Lieutenant Webster. Some men are just a little more fragile than others, you know?" "You're telling me that he is the victim here? Are you f**ing crazy?" "Oh, I am saying nothing of the sort, Sheriff. I am well aware that a heinous crime has been perpetrated here, that some poor girl was abused and murdered, but this was all twenty years ago ... I just think Michael Webster is incapable of establishing any kind of stable ground for his own defense, and I would like to think I am assisting him with his constitutional right to fair representation when it comes to his day in court." "This is just bullsh**, if you don't mind me saying, Mr. Wade." What Gaines suspects, beyond the possible violent act in the past by Webster, is that Wade himself is somehow involved in the coverup, for reasons of his own. Or could Wade have been the killer? It's complicated. And Sheriff John Gaines can't get to the truth without sorting his own war memories and what they have done to his capacity to be human, to be caring, to take part in community. Don't be confused by earlier releases of the book in the United Kingdom; this is the American release, orchestrated by Overlook. If, like me, you carry conflicting emotions and memories of the Vietnam War years, here is a potent narrative in which to reconsider your own past, as well as the country's. And if you value a crime novel that probes the vulnerability and courage of the mind -- as Charles Todd has done with his World War I-era detectives, for instance -- you'll want the book on your shelf for repeated reading. Add it also to novels of the South and the grief and beauty entwined there. It's a small world, true enough. But in the world of mystery fiction, it's also a very wide world with more good books and skilled authors than most people can catch up with. Still, I'm always somehow surprised when I find an established author I've never heard of ... and delighted, because a list of previous books comes along with the discovery! This season I finally read a book by British author Rebecca Tope, thanks to publisher Allison & Busby sending an after-publication copy. Tope's current two series are one set in the Cotswolds (a place I'd love to walk sometime) and one set in the Lake District (dear to my heart as a lifelong fan of the Swallows and Amazons children's books). 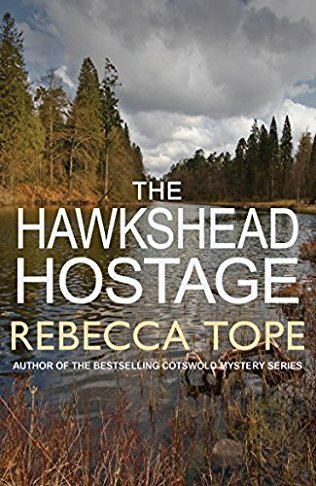 THE HAWKSHEAD HOSTAGE is in the Lake District group and features florist Persimmon "Simmy" Brown, who also appears in five other mysteries. Out of habit, Simmy switched on the phone, and within a few seconds it gave the little song that told her she had a message. Bonnie, she supposed, with a question about the shop. It was a voicemail, not a text, which suggested it might be urgent. With a sigh, Simmy put the phone to her ear, reluctant to discover what mistake the girl might have made without having recourse to advice. "Simmy!" came a high-pitched voice, full of panic. "There's a body here. Under the trees, at the very top end of the lake. I don't know what to do. Well, I'll have to call 999. Who knows when you'll get this ... Hey!" The phone went silent in her hand, even though she continued to listen for further speech. It was Ben. The last syllable had been closer to a scream than a shout. ... Not until that final word did she understand that this was real, and that the boy was not merely panicked but terrified. When the body's found but Ben isn't, it's clear whoever killed the man on the hotel grounds must have taken Ben as a captive to protect themselves. Simmy of course feels responsible -- she gave the young man a ride, and he's gone missing. But all her efforts run into dead ends, and it's Bonnie who puts the pieces and clues together to guess at what has happened to Ben and where to look for him. It takes so long to reach a solution -- what shape will he be in? Alive, dead, injured? And is there still a way that Simmy can make sure the young people survive to confront the criminals? A lively read, jumping from one point of view to another, and not entirely easy for someone who hasn't read any of the other books in the series -- but well worth it, to realize what a good run of books by Tope is waiting to be read. In fact, since she's worked with three English-countryside series (the third is her West Country Mysteries), there's a big stack ready. That's great news! There's a new-ish trend among university presses that's fascinating to observe: an urge to publish fiction, including thrillers and mysteries, set in the press's home state. When the University of Minnesota Press began to publish the Scandinavian/Minnesotan fiction of Vidar Sundstøl, I became an instant fan. And now the University of Nevada Press presents David Kranes with his outrageous and delightful detective tale, ABRACADABRA. Kranes is an established author of seven other novels and many short stories, and lives in Salt Lake City, Utah, where he is a professor emeritus at University of Utah. He clearly knows Las Vegas well -- but more importantly, he's willing to risk his dignity by creating a detective with a head injury that takes him well beyond "the facts of the case" -- and crime-solving assistants like the Bloody Marys (a network of cocktail waitresses) and his own team of celebrity impersonators (Shaquille O'Neal, anyone?). 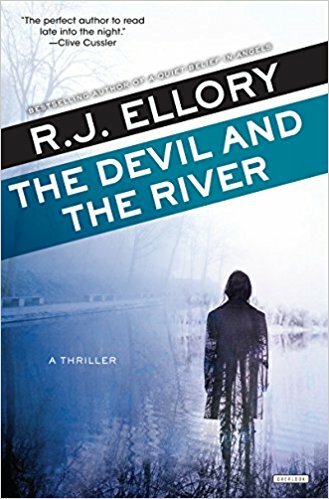 As a detective, Elko Wells is far outside the usual (and he used to be a pro football player, another wild aspect). Then again, the case Elko tackles in ABRACADABRA is also outside the box -- literally. Lena Goodson wants him to find her husband Mark, who, trapped in a very uncomfortable marriage, has just escaped her, by leaving backstage during a magician's act that should have resulted in his simple reappearance in the traditional black stage box. Plenty of fun and entertainment here, along with magic tricks and classic cons, as well as a sense of the mysteries of love and life and of course impersonation, whether intentional or not, and its, shall we say, spiritual aspects. Grab this one for a very unusual blend of offbeat detection, caper, crime, and discovery. 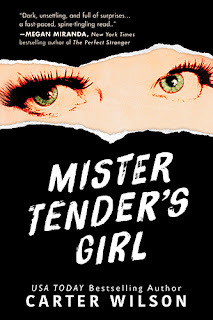 Coupled with the title, the cover on Carter Wilson's fifth book, MISTER TENDER'S GIRL, scared me -- in fact, I found the combo so creepy that I almost skipped reading the book. And that would have been a mistake, because this is one of the smartest, well-twisted, enjoyable thrillers I've read this year. Wilson's area of the mystery/thriller genre has been labeled "dark domestic thrillers." In MISTER TENDER'S GIRL, the action opens in Manchester, New Hampshire, a gritty, once-industrial city that now hosts a fine crop of tech firms and coffee shops, along with a charmingly diverse population. It's the coffee shop aspect that matters here -- Alice Gray, whose name was originally Alice Hill, owns a coffee shop, and in addition, a colonial-style, century-old building nearby where she lives: In one building, her low-keysecond-floor apartment where she lives (quirkily, she has no knives in her home), and a third-floor space rented to a quiet tenant she barely knows. Things are going along reasonably well for her. She rarely misses England, where at age 14 she was brutally attacked by a pair of teens like herself ... and her carefully constructed new life lets her mostly hide from her past. Until, one day, an online dating site she's signed up for, to satisfy a friend who thinks her life looks lonely, gives her a match from a name deep in her past: "Mister Tender," the name of the most outrageous character in a graphic novel series created by her now-dead father. The horrors are about to open up once again. The creepiest part of the disaster Alice is walking into is the sense, even in Manchester, NH, that she's being watched by some evil linked to her past. Someone online knows about the crime against her, the killing of her father, and even where she was this week -- in fact, it looks like she has multiple stalkers, and no safe place to go or person to be with. Add her very odd mother to that list, and an ex-boyfriend, and people back in England, where the bizarre and cruel changes of her life began. Today is the fourteenth anniversary of my attempted murder. I had almost forgotten, but my phone screen reminds me. October eighteenth. I remember it mostly as it was referred to in court, the solicitors repeatedly saying, "On the night of October 18 ..." I will hold no memorial on this day, carry no special reflections. I'll just try to get through it as I do every other. But before I type a single thing, a direct message appears in the inbox of this forum. It's from the master of ceremonies himself, Mr. Interested. This level of threat soon puts Alice on the run, back to the site of the original crime and colliding with her would-be killers. Yet someone, or maybe multiple someones, continues to track her and communicate. 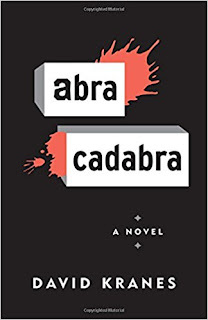 This is a true page-turner, an assembly of threats that feel so close to home that the twists of plot become both chilling and agonizing -- who could be knocking at our own social media doors? Wilson's finale provides even more twists, and a threat level that's over the top, but mercifully quick to resolve. Whether Alice will survive is always in doubt. Along with whether she'll ever feel safe again. A must-read for anyone who can handle the suspense of wondering whether their own Internet-connected life might be, shall we say, just a bit risky after all? Best of all, Wilson's created a tie to graphic novel work that's stunning. 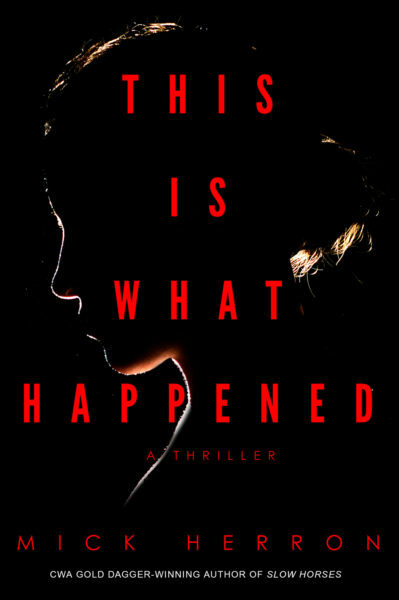 I'd recommend this one for all thriller readers, with the reassurance that in spite of the terrifying aspects of the cover and what "might" happen, the book's resolution is highly satisfying -- go for it. I'm a major fan of Mick Herron's "Slow Horses" espionage novels. They're British and embedded in the classic MI5 framework -- but with a major twist that provides protagonists who are "failed spies," people who've messed up some major operation but can't be simply fired because they already know too much. Stashed among the misfits at Slough (pronounced Slow) House, they wither in their own estimation and in the noxious atmosphere provided by their "head of station." My mistake. Unless I missed a very small mention (and I don't think I did), none of the Slow Horses spies turn up in this stand-alone suspense novel. Maggie, turned loose as a temporary infiltration agent, could be any one of us -- how would you do if thrust into a life-and-death, possible prison condition in a matter of hours after work one day? Who could save you?? 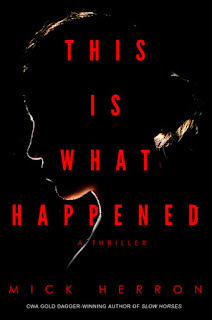 Herron shapes a novella of psychological suspense in THIS IS WHAT HAPPENED. I won't shelve it on my Slow Horses section, but rather next to some work by Barbara Vine (aka Ruth Rendell in her most twisted voice) and maybe even Stephen King, for the all-too-human pain involved. It's quite a read ... hope you pick up a copy to experience this other side of Herron's craft. Slow Horses fans, keep in mind June 5, 2018, when the next in this series releases in the US: London Rules. Many thanks to Soho Crime for helping Herron keep these on a roll. Nothing is simple in Mark Winkler's crime fiction -- least of all the motivation of the protagonist. 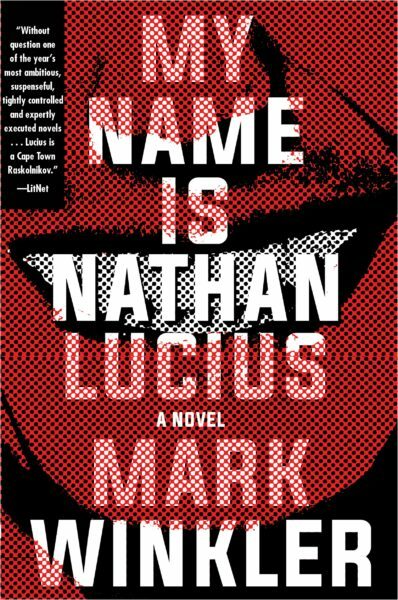 In MY NAME IS NATHAN LUCIUS (his "fourth" title but actually his second novel, originally titled Wasted), Winkler provides a setup that should be transparent: Nathan Lucius is telling his own story, in detail, including his emotions and his, umm, peculiar forms of unclean mind. We should know whether he committed any crimes, and why -- right? Well, no. Not the way Winkler spins this very usual and gritty work of noir. Nathan Lucius, age 31, an ad salesman for a newspaper, has unusual filters for what's important to comment on, and what's not. Running, drinking, jerking off ("wanking" in British slang) -- those are his primary concerns. Almost accidentally, in his preferred life of days-all-the-same, he's made a friend, the owner of a secondhand shop. This owner, Madge, is dying of cancer, and soon we realize Madge and Nathan are considering how he might help her to end her life. I'm expecting a tough Cockney from a BBC cop show. I suppose it's the name. Morris has a heavy Afrikans accent. It would be a mistake to associate the accent with stupidity. People have done that before. I'm not going to. The room is so small that he has to squeeze himself against the wall to get around the table. He sits opposite me. He thanks me for coming. I put my sad face one. I tell him the facts as I'd told them to Mrs du Toit. "So you've known the deceased for ...?" "Forgive me, I have to ask. Was there anything, ah, inappropriate about your relationship?" "Goodness, no." I sound just like Madge. 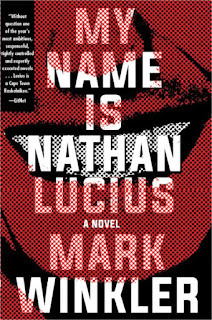 Blurbs for the book in advance talked about its exploration of violence, trauma, social responsibility, memory, morality ... I would rather say it's a daring adventure with an unreliable and unlikable narrator who nevertheless turns us into his witnesses, for court and elsewhere, with a related crazy mix of horror, appalled laughter, and insistence on knowing what comes next. Don't read this unless you're ready for very, very dark (think Dave Zeltserman even more than Thomas Harris). But if you do pick it up, clear the schedule, because you'll need to finish it before you'll be able to do anything else. And then, you'll want to wash your hands. Twice. From Soho Crime (Soho Press) comes this unforgettable transplant from a distant continent, straight into our most unsettling postmodern unease. Sometimes books arrive here for review after they've already been released -- and KILLING PACE is one of those. I wasn't wild about the title, and the (misleading) cover suggested a sort of Celtic time lapse ... but I finally opened the book and then quickly lost track of time, absorbed in this powerfully told and complicated page-turning thriller set in Florida and in Sicily. It's Douglas Schofield's third, but not part of a series; he tends to write female protagonists (and explains something about that here -- in ways that interest me a great deal). And his extensive background in criminal prosecution, as well as globe-trotting, makes him an ideal source for his own plots. 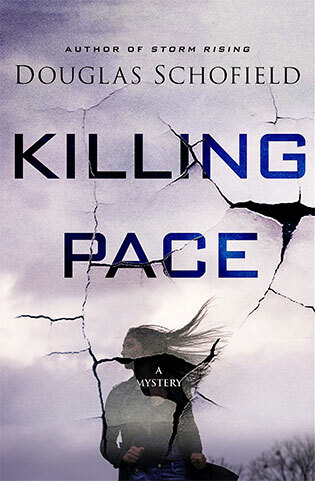 In KILLING PACE, a woman's been held near-prisoner by her presumed fiancé, but it only takes a small breath of freedom for her memories of another life to flood back. Soon we're chasing major criminals in Italy with a woman of another name who works for the U.S. Customs investigation team -- same person? Some answers flash quickly; others, like who's behind the crimes around her (parts smuggling; baby kidnapping) are slower to mesh. But the twists keep coming, and so does the action. She could live with being the roughly assembled product of Silvana Pace's obsessions. Today, Laura Pace was a fugitive from the law, hunted for crimes she didn't commit. Today, a police officer had broken the law to prevent her from being arrested. Tonight, she was lying in a bed in a safe house run by a secret United Nations intelligence until whose activities probably violated a score of U.S. federal statutes. Intrigued? It's quite a ride, really well written, and convinced me that I want to read more from this author! The publisher is Minotaur, and I'm sure there are more titles on the way. Last year's mystery from Randall Silvis was Two Days Gone, a superb work of compelling suspense that tested the impact of once-in-a-lifetime friendships, while also inquiring into how writers do that mysterious "slice open a vein" action and live to tell about it ... or not. Police Sergeant Ryan DeMarco's investigation led him into immense pain over the loss of his writer friend, and also across the line into killing a killer. 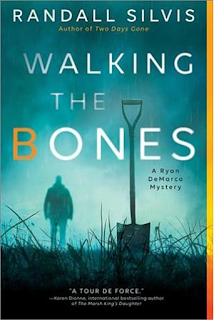 In this year's new Silvis offering, WALKING THE BONES, DeMarco is determined to recover from his losses -- and to get around to the foundational work that his romantic relationship with a fellow officer, Trooper Jayme Matson. It's already a fraught affair, taking place around his obvious case of depression and PTSD and haunted by his child's death and the way his wife has abandoned him (but not yet divorced him). Is there any chance he can regain enough health of heart -- emotional and physical -- to meet Jayme's expectations? Things look rough -- but when a cabal of quirky justice seekers in Jayme's hometown of Aberdeen, Kentucky, enlist DeMarco to investigate the deaths of seven young women (only their bones remain), his sense of purpose moved back into position (and Jayme's egging it on). At sixteen [DeMarco] was still fleet of foot, and by then had gotten a name for himself as a street fighter thanks to his quick hands and footwork. His knuckles were still scarred fro some of those fights. In the army he could do five miles with a full pack and still be the first man to the showers. But he had been forty pounds lighter then. And unburdened by the elephantine weight of a conscience that rendered all unnecessary movement futile. He wondered if Hoyle had been aware of the metaphor he had created by describing the girls as cocooned in plastic sheeting. Hoyle, as strange as he was. did not strike DeMarco as man who chose his words lightly. And it made DeMarco sad to think of those girls as unformed butterflies. They had never been given their wings, had never tested the sky. And now every time DeMarco saw a butterfly, he would think of those girls. For DeMarco to solve the case, he'll have to push well beyond his current physical limits, and risk both his life and his heart, under grim conditions that reminded me at times of a Stephen King horror plot. But don't underestimate him -- or Jayme, who's determined to somehow pull him back to life. A fine read; I only wish DeMarco's series came to publication more often than once a year. This one, like its predecessor, comes from Sourcebooks. Readers of Julia Keller's West Virginia mysteries will feel at home in this Silvis series; those to value the mysteries of Charles Todd and Louise Penny will also recognize the soul battle underway.